In the second half of October Facebook’s Instant games platform has seen a huge surge in users, and it’s all down to one extraordinary sharebait app. 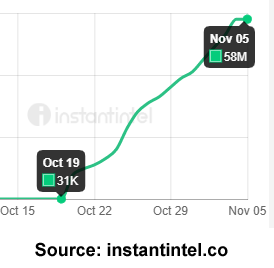 OMG, from an obscure Philippines game studio Supergene Inc. has surged from a base of 31,000 users on October 19 to 58m daily users in just 17 days. That compares with a usual top-ten figure of 10m. 58m represents 17% of all daily users on the platform. Although Instant Games is clearly a games platform, OMG is effectively a collection of clickbait sharing memes masquerading as quizzes. This clearly has been extraordinarily successful, as OMG now has 6 times the previous top-ten average games on the platform. Stalwarts like Everwing and 4 pics 1 word have been consistently popular but Everwing maxed at 14m users in June and 4 pics, which had a previous life on IOS and Android, has had 5-7m users for most of 2018.